YSaC, Vol. 770: To bee or not to bee? YSaC, Vol. 831: Dumps like a truck, truck, truck. *shudder* As someone with bad apiphobia (fear of bees) that pictue will probably give me nightmares. I also wonder why he didn’t bother to talk up any of the good points about the truck. “Low mileage. New tires. CD changer,” or whatever. He seems more concerened with convincing us to never, ever go near the thing. Great sales pitch! I have the same phobia! This is scary! It reminds me of a scene from the movie “The Secretary” in which one of the characters is found dead in their car and upon inspection a bee is seen crawling out of his mouth…totally creepy! For me this would never work however if you like raw honey this might be the truck for you! I did not see that movie! I’ll never understand it. A person has a computer, the internet, the knowledge of how to post ads and receive responses off of a community forum. BUT doesn’t know how to call an exterminator? WTF? Yeah, hey, do you think there’s any other way we could deal with this? Other than having a truck sitting around swarmed by bees for MONTHS? Nope. Guess I have to sell it. Exterminator, beekeeper, maybe an exorcist? That many bees on a truck looks like some kind of biblical plague! My husband hauls beehives commercially on a flatbed semi truck (brings them to farms, etc for pollenation)….He’s got a bee-suit & he’s quite used to his own truck looking worse than that pickup. Given that fact, he thinks $1200 isn’t a bad deal for a pickup truck….LOL he says tell him where it’s at and he’ll show up in his bee suit for a test drive ?? What he didn’t reveal is that the truck is parked over Homer Simpson’s pile o’ sugar that he stole from Hans Moleman. Then an English guy pops out and steals your sugar when you doze off. The bees…! They’re defending themselves somehow…! this is for you YSAC: do you offer some kinda reward or something for most ridiculous and/or destined not to work type ads? Hey, this same thing happened to a friend of mine, but it was wasps and a Porsche. It figures. Bees are more of a blue collar working insect. But those wasps are just so flashy. My grandfather was a beekeeper, and he often would go out to other people’s properties and “capture” their swarms. They are just looking for somewhere to live! This guy and his truck… LOL! Just call a bee person already!! Around here there are people advertising on CL everyday to come remove swarms for free. After all, free bees when you’re a bee farmer is a pretty good deal! No it’s not. Containing a swarm of bees is a LOT of work. Yes, you get the bees (and the resulting products)… but, they may die just as soon as you get them situated in a hive. VERY few beekeepers will take care of your swarm for free! That’ll give you, er, bees. Is that a reference to Tim Curry in a perfumery? How does this even HAPPEN? That’s what I’d like to know. Yeah, big deal. Wear one of those beekeeper suits and walk away with the DEAL OF A LIFETIME. It’s a Ford, ain’t that good of a deal no matter what. ?? Now a Dodge Ram, I’d be all over it in a second. The best laugh I had in a long time! Thanks for posting! Oh thank you, that made my day. If no one else had made that comment I would have myself. I was scrolling through the comments to see if someone else had made this joke before I posted it myself. xD Well done! Me too! XD I do so love Eddie Izzard. But seriously I am going to end all my sentences with “too many bees.” I think this is a good idea too many bees. That’s funny too many bees. Maybe HE’s the exterminator, and all his exterminating stuff is in the truck? I know this bee post is old, but you just made my Tuesday, August 10th, 2009, Rocky. It’s the long awaited sequel to Snakes on a Plane: Bees on a Truck! Ok, so instead of calling a beekeeper or exterminator and paying a couple bucks, he would rather not go to work, risk getting fired, and lose so much money that he has to sell his truck?!!! That’s messed up. Best reason to sell a truck ever. My boyfriend had an old Honda that he wasn’t using and he left it out front in his condo complex. It sort of rotted there and eventually wasps built nests in it. Eventually the home owners’ association said he had to move it because the wasps were a hazard. He got around the wasp situation by donating the car to charity. They didn’t care about the wasps. I think he warned them ahead of time before they picked it up. I think. He got the tax write off, anyway. This is my new favourite post here. I’m reminded of that movie The Deadly Bees. You should superimpose the outlines of Crow, Mike, and Tom Servo on this photo. And no mention of even a year of make so you can’t blue book it. I’m curious how this will help his work situation. On the one hand, no longer having a vehicle too bee-infested to drive. On the other hand, no vehicle at all. This is kind of off topic but a co-worker at an old job once got suckered into “car-pooling” with another office mate who lived near him. This plan immediately fizzled when he went to pick her up one morning and eventually gave up when she never appeared. She showed up at work later that day and sent him a note saying she had “temporarily gone blind” and thus wasn’t able to dial his number correctly (or find the front door I guess.) I thought that was the greatest excuse ever. I stand corrected and salute you, too many bees. He said he wouldn’t test drive it with whoever comes to get it, because there’s too many bees. All it would take is a suit and a can of raid, and you’d have yourself a free truck. You are exactly correct, except that the truck is advertised for $1200, you simpleton. In fact, she got it perfectly right: if the owner is not going to be with you on the test ride, there is nothing keeping you from getting rid of the bees and taking the car on a very, very long test ride. Several years long, probably. It sounds like a great opportunity for someone who can wield a can of RAID. This happened to me once. I turned on my hose and sprayed them off from 25 feet away. Any bees that came at me I shot down with the spray jet. All the bees were washed up in five minutes. What’s the problem? Why was the truck sitting so long that the bees were able to set up housekeeping? You all OBVIOUSLY missed the joke in this!!! LOL Come on!? If it were me, I’d just set the truck on fire and be done with it. Or call an exterminator. I suppose it would depend on my mood and whether or not I happened to have a match in my hand…. seriously, i almost want this thing for the novelty factor. 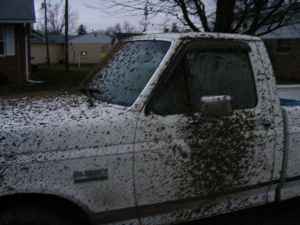 I like my trucks like I like my coffee, COVERED IN BEES! Looks like a honey of a deal. OMG that’s unbelievable. I guess it’s even a little bit funny ?? Somebody should send this truck to Nicolas Cage. -> I believe he’s swapped out ‘punctuation’ for ‘perforation’. My briefcase full of bees aught to put a stop to that. Hope he posted that to Farm & Garden – never know when someone is looking for a hive to pollinate the crops.